This unforgettable experience begins with as you bid Vegas behind and settle back for the ride through the Mojave Desert. Look for wildlife, fauna and flora alomng the way and revel in the wilderness before you Hualapai Ranch for an overnight stay in a private en-suite cabin. From the ranch relax or you can take the hop-on, hop-off shuttle bus to Guano and Eagle Points for more breath-taking panoramic views of the Grand Canyon. Explore the Hualapai Native American Village including the gift shop and the Skywalk Cafe and maybe be brave enough to try the 4,000 feet high Skwalk! 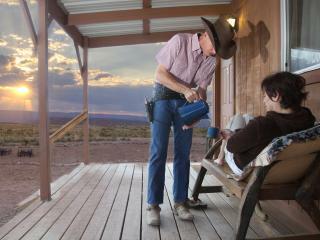 Check-in to your climate controlled cabin at the Grand Canyon West Rim Hualapai Ranch featuring bathroom with shower before enjoying a Western-style meal at the Dance Hall then relax surrounded by the glow of the campfire while enjoying Western hospitality, under the twinkling Arizona stars. The next day, after breakfast, go native and enjoy a trail hike along the Rim of the Grand Canyon or choose from an option 30 or 60 minute horseback ride along trails that skirt the edge of the West Rim. Then, once you've had your fill of this 'wonder' it's time to head back to the neon lights of Vegas. Around 30 hours hotel to hotel. 100% cancellation charges are applicable within 45 days of the tour date.